Designed for the convenience of home use. The digital moist heating pad provides temporary relief from pain associated with muscle spasm and inflammation caused by strain and tension. require continuous contact with a spring-loaded switch to generate and maintain heat from the pad. 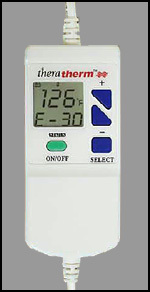 • Digital hand control allows operator to program, as well as monitor, the temperature and treatment time. • Lockout mode protects against inconsistent changing of the control settings throughout treatment. • Allows patient to relax and enjoy therapy without the hassle of maintaining contact with a hand held switch. • Therapeutic treatment temperature between 88° and 166° F.
• Treatment time between 1 to 60 minutes. • Specially designed flannel cover.